The same can’t be said for Ben Fankhauser, playing David. I’d never even stopped to worry that the actors wouldn’t be up to par to their movie counterparts, but David and Racetrack (played by Ryan Breslin) were two characters who were particularly…cringeworthy. As for Racetrack, I just love Max Cassella and how he plays Race in the movie. He’s more charming and endearing than Breslin’s brash portrayal. I was pleasantly surprised, though, to find that I recognized one of the newises – Alex Wong, who had been a contestant on So You Think You Can Dance. He was pretty amazing there, so it was nice to see him get on with his career. Knowing all the lines by heart made it tough to sit back and be calm when the wrong words, sentences, and lyrics were uttered onstage. This was particularly annoying because I felt that certain changes were made for no ulterior purpose other than to make changes. Not a very necessary change, you’ll agree. With regard to character modifications, Jack doesn’t seem to feel a lack of family in the show, as he did in the movie. He doesn’t join David and his family for supper. He still wants to escape to Sante Fe, but it’s more about escaping the squalor of city life and the burden of responsibility he feels for the newsies. I also noticed that while discussing the strike with Katherine (the reporter), Jack tells her to bring her camera – in direct contrast to the movie where he explicitly tells Denton (the reporter) not to take pictures, the latter being the smarter move, as Jack’s a fugitive. Jack is supposed to be street-smart, which makes this revision confusing. And then there’s Jack’s closeness to Crutchie, which leaves David with a much smaller role. I’m okay with this because the less I saw of David here, the better. Of course, the biggest change was the entire ending. For some reason, Jack waltzes into Pulitzer’s office to invite him to the rally. Pulitzer responds by telling Jack to go to the rally and convince the newsies to go back to work, threatening to imprison his friends if he doesn’t. So Jack does that, and the newsies think he’s crazy, and then he comes around and makes the strike notice on Pulitzer’s press. The depth of betrayal in the movie is much deeper. After Jack riles them up, the newsies actually see Jack going back on his word, dressed up all rich, selling newspapers, and seeming to not care about them and the situation he’s put them in. When they confront him, he shrugs his shoulders. I understand that everything gets more dramatized in a play, but there was an element of telling over showing that I didn’t like. For example, when they decide to make the strike notice to distribute to all the child laborers, Katherine gets all gleeful that they’re using Pulitzer’s own press to get the word out. In the movie, the irony’s stands for itself. And thanks to winning those lottery tickets, my friend and I sat three rows away from the stage. I’m not sure if this provided us with a unique vantage point but, boy, was there a lot of spitting from the actors. Arcs of spittle flying everywhere. Sorry, it sounds gross, cuz it was. Waiting in the darkened theatre for Newsies to begin, I’m not sure if I was nervous that the show would be bad…or that it’d be good. My verdict? I thought it was good. Would it have been better if it had followed the movie more closely? Yes. Am I happy I saw it? Absolutely. I completely agree. The ending change made little sense and the new betrayal just seemed weak and shallow. Plus the arrest scene in the movie was one of my favorites. I have to say though I like the new songs like Watch what happens, Brooklyn’s here, and the Watch what happens reprise. Plus Nick’s and Spot’s roles were shruken so much and they were my favorites. Anyway I thought it was good but the movie was so much more powerful! I heard a couple songs before I saw the stage show through Pandora. It was “Seize the Day” that made me want to see the stage show. I loved the stage show and want to own the Broadway soundtrack. My emotional connection was formed by the relationship between Jack and Crutchie. I even loved the relationship between all the Newsies because I love how they all treat each other like family. I loved Katherine, Davey, and Les. I loved how Jack is actually an artist and some of his drawings are to be used for the paper. As a matter of fact, a month of so after, I listened to some of the clips from the movie. As for my opinion, I prefer the songs from the stage show. They have a more emotional feel to it. I even listened to Jack’s solo, Santa Fe, from the movie. I prefer it in the stage show because it is presented as more of a sad song, which helps strengthen plot. It is understandable why Santa Fe is presented as a sad song because it happens after the big brawl and you see Jack seeing that Crutchie is taken to the Refuge. All of this adds inner conflict to Jack Kelly, which is reflected from this song all the way to the end. In other words, I am more of a fan of the musical. I think it just depends on what you saw first. I even love the lyrics in the stage show first. I have nothing wrong with Katherine being Jack’s love interest. “Something to believe in” is such a beautiful song. I did not like it. “Seize the Day” was the reason I fell in love with the ‘Newsies’ in the first place. Not being able to sing along in my head to the original lyrics was a HUGE disappointment. Although overall I enjoyed the show, I do wish the play followed the original movie script more. It was still a fun to watch on stage, and I would see it again if given the chance! I completely agree! I was actually pretty disappointed in the play. The changes made me cringe throughout the entire show! My precious Newsies songs and favorite lines were butchered. Ugh… and the songs they added in- terrible! What a bummer! Personally, I didn’t think it was THAT bad, but at least you can re-watch the movie as many times as you like! Now changes are absolutley necessary in an adaptation. If they kept in everything it would be so boring and too similar to the movie, which was cult for a reason, unlike the musical which is a huge hit! And I thought the new stuff was wonderful! Harvey Fierstien, who wrote the book for the musical, did an amazing job adapting this cult movie, he is a an amazing and has won numerous awards, including a Tony Award for Best Book for Newsies! The songs they added in; amazing, they won the Tony for best score so…there’s your answer right there. 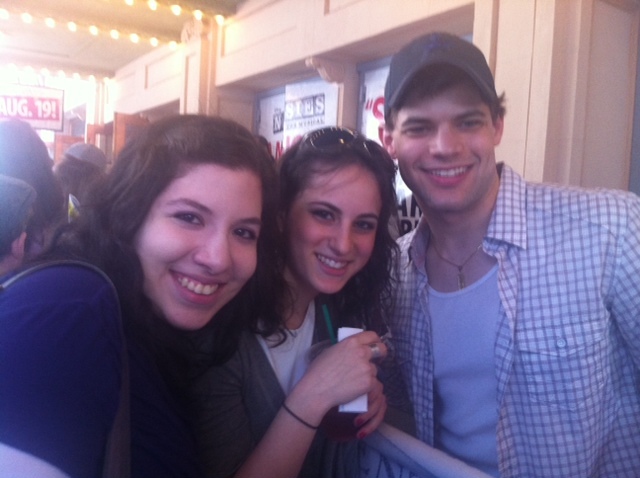 Newsies is probably my favorite musical, and someone I know is in the show. It is defintley an amazing adaptation. I think the woman who sings “Patrick, darling…” has a better voice than anyone in the play. jack’s voice was obviously better in the play but you just can’t get the character development that you can in the movie. I liked Jeremy Jordan in the show, but no one can replace Christian Bale’s Jack in my eyes. Just saw the Broadway version last week and there were things I loved and didn’t like. TOTALLY agree with you about David. He came across whiny and nerdy in the play and it bothered me bc his characters goes through a pretty awesome arc in the movie. They pulled a lot of his story to make way for Katharine I think. That being said I actually did like Katharine’s addition to the story. I just keep picturing her on the front lines of the suffragettes in 20 years haha. Also, loved Crutchie. Movie!Crutchy always annoyed me and I skipped over his parts. Stage!Crutchie is awesome, his friendship with Jack is more developed and it doesn’t hurt that the actor is cute as all get out. I think ALL of the singing is better. These are trained singers and it shows. It was nice to hear Sante Fe as it should have been sung. That last note is badass. Only singing I missed was Max Casella in “King of New York”. I don’t know what it was about him but there is NO ONE else that could have played his part. BUT, my BIGGEST complaint: Spot Conlon, where art thou?! Seriously, Spot Conlon was the reason I started liking boys. He like kick-started my adolescence hahaha. I had such a MAJOR crush on him in that movie. They basically erased him from the play. SO disappointed. He shows up at the very end and like says a line or two. Was it really too much for them to add: “Never fear, Brooklyn is here.” That’s all I wanted haha. Definitely worth seeing though. The choreography alone was just mind-blowing. And I spotted 4 SYTYCD alumni on there which was pretty awesome. I haven’t seen the Broadway version. But I have listened to the CD and I would agree that I felt some lyrics were changed for the sake of change. My main concern is how sweet the story sounds from the CD. Jacks vocals take on more of a Boy Band Pop whine which is quite annoying and the darkness of the tale seems to be unnecessarily light. The stakes seem to be very small. Yep, I agree, and I know exactly what you mean about Jack’s vocals…I would say that it’s not as bad when it’s heard in context, and when you can see Jack’s face, body language, and acting. Watching the show’s an enjoyable experience, especially because you can always re-watch the original on DVD. I’m more wary about rumors that they want to make another Newsies movie!